wow, a very powerful story! I listened to this one on my iPod. I tried so hard not to cry (especially toward the end) but I finally had to pull over and wipe my eyes when it ended. So much grief, redemption and joy. A fantastic story that drew me in and kept me glued. 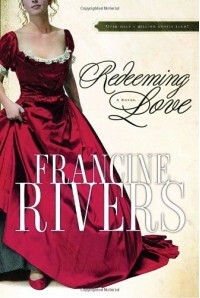 Its a historical romance set in mid 1800's gold country region of California. Angel is a damaged young woman working a brothel and struggling with many horrors from her past. Michael is a devout Christian who believes God wants him to marry Angel - a soiled dove. Apparently this is a retelling of a bible story. I think this may be only the second Christian themed novel I've ever read, which means its the first one I ever finished. While it was very inspirational it refrained from being preachy. Its not a light read, and at times was even depressing. But the writing was so spot on and the characters so real I couldn't stop. And it does end with a great ending. I can't tell you how many times I wanted to crawl into the book to talk with Angel, hug Michael, slap his brother, kill a bad guy, shelter a person down on their luck...etc. I can see why it has such high ratings by sooooo many people. But my next book will be a light read. I don't think I could take two books like this in a row!